YuzuMura.com is closed for the foreseeable future. See details on our home page. Three Tree Tea offers two grades of Matcha meant for uses such as baking cakes and cookies, making ice cream, seasoning, mixing with salt for dipping and so on. No sugar is used in these items, so they are best for cooking applications where you would want to control the sugar content. The grade is not quite suitable for tea ceremony but excellent for scenarios when you would need larger quantities for flavoring your recipes. Some people who want a sugarless alternative to our Matcha Latte product have had success with the Grade A blend, though the lack of sugar can make blending drinks a little bit trickier; you may wish to use a matcha whisk for such applications, or perhaps an immersion blender. 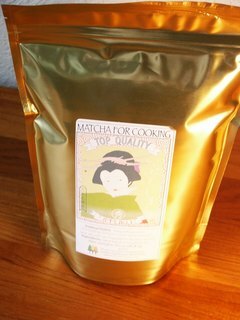 I find the Matcha For Cooking Grade A excellent for most high-moisture applications (moist cakes, creams, drinks) and the Grade B suitable for dry things like cookies. Description: The best quality still affordable for culinary purposes, in a 1 lb. resealable bag. The best quality still affordable for culinary purposes, in a half pound resealable bag. Copyright © 2004-2005 Yuzu Trading Co. LLC. All Rights Reserved. Product marks, logos and trademarks displayed are property of their respective owners.